Transparency Market Research (TMR) (www.transparencymarketresearch.com) has published a new report titled ‘Sinus Dilation Devices Market - Global Industry Analysis, Size, Share, Growth, Trends, and Forecast, 2018–2026.’ According to the report, the global sinus dilation devices market was valued at US$ 2,021.4 Mn in 2017. It is projected to expand at a CAGR of over 8.2% from 2018 to 2026. Advantages of minimally invasive sinus surgeries over traditional surgeries, focus on research and development and product launches by market players, increase in pollution contributing to a rise in the prevalence of chronic sinusitis, and technological advances are expected to augment the market in the coming years. The report offers detailed segmentation of the global sinus dilation devices market. Based on product, the market has been segmented into balloon sinus dilation devices, sinus stents, endoscopy, FESS instruments, and others. The endoscopy segment has been further sub-segmented into sinuscopes and rhinoscopes. The balloon sinus dilation devices segment is expected to remain dominant in terms of revenues during the forecast period. The growth of the segment can be attributed to a rise in the number of balloon sinus ostial dilation procedures performed annually and the various advantages offered by these devices. The advantages offered by these devices include reduced risk of tissue or structure damage, reduced need for post-operative medication, faster recovery time, short hospital stay, low risk of bleeding, and reduced risk of scarring. Based on procedure, the market has been classified into standalone and hybrid. The standalone procedures segment dominated the market in 2017 and is anticipated to remain dominant during the forecast period. This segment is likely to expand at a significant CAGR in the coming years. The use of balloon sinus dilation surgeries as standalone procedures reported an increase from over 5% in 2011 to 22.5% in 2014. Hybrid procedures as a treatment option are considered by patients with frontal and sphenoid sinuses. In terms of patient type, the market has been classified into adult and pediatric. The adult segment is projected to expand at a significant pace during the forecast period, owing to a rise in the adult population. Weaker immunity levels in the adult population leave them susceptible to infections, leading to the higher prevalence of chronic sinusitis in adults. In addition, rise in levels of pollution globally is anticipated to increase the prevalence of chronic sinusitis. In terms of end-user, the global sinus dilation devices market has been categorized into hospitals, ambulatory surgical centers, and ENT clinics. The hospitals segment held a prominent share of the market in 2017. Expansion of the segment can be attributed to patients’ preference for operation theatre surgeries. However, the market has been witnessing a paradigm shift toward in-office procedures, contributing to the high CAGR growth of the ENT clinics segment. In terms of revenue, North America dominated the global sinus dilation devices market in 2017. The market in Asia Pacific is anticipated to expand at a rapid pace during the forecast period. 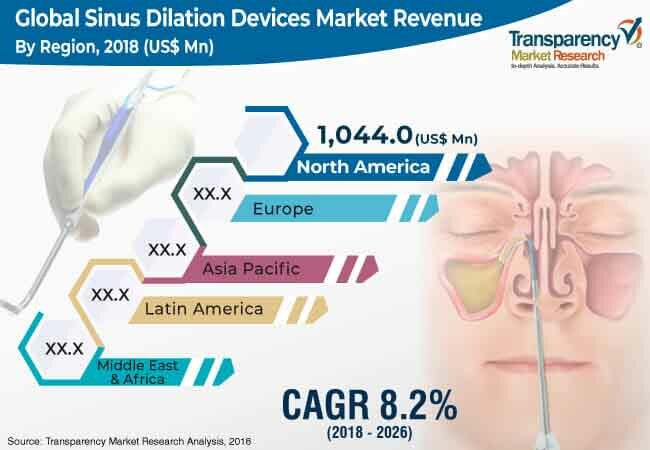 Expansion of the sinus dilation devices market in the region is attributed to an increase in the prevalence of chronic sinusitis. Additionally, new product launches, changing reimbursement scenario, rise in focus of market players on strengthening their presence in the emerging markets of Asia Pacific, and budding presence of local players are expected to contribute to the growth of the market in Asia Pacific. The report also provides profiles of leading players operating in the global sinus dilation devices market. Leading market players include Medtronic plc, Smith & Nephew plc, Olympus Corporation, KARL STORZ SE & Co. KG, Acclarent, Inc. (Johnson & Johnson), Entellus Medical Inc. (Stryker), Intersect ENT, Inc., SinuSys Corporation, Meril Life Sciences Pvt. Ltd., and Dalent LLC.. Market players have adopted the strategy of product launches to enhance their customer base. For instance, in April 2018, Intersect launched its SINUVA sinus implant in the U.S., designed for the treatment of nasal polyp disease in adult patients.